A quiet, light weight gas blower, the Tanaka TRB24EAP blower saves you the trouble of dealing with a complicated start-up system. This Tanaka blower starts up immediately and has strong blowing power: up to 170 mph. Its high-quality and durable construction is easy to see and feel just from holding it. The powerful blowing is ideal for large tracts of land and big debris. Additionally, it’s comfortable to hold and feels balanced in the hand. 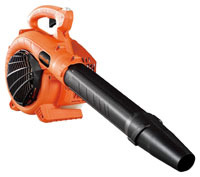 For $149.99, you’re getting a high-powered leaf blower with no start-up hassle to deal with.